So mega Maverick Mark Cuban has gotten in trouble with the SEC for insider trading ala Martha Stewart. Cuban, the owner of the Dallas Mavericks NBA franchise and a multi-Billionaire (yeah that’s a B), got a tip about a stock and he sold them immediately, saving himself about $750,000. The stock that got him in hot water was for an Internet site called mamma.com. Oh, and sorry. I just couldn’t stand to put the video on my blog. I really abhor Styx, but if you’re dying to hear the song now, click here. Domo Arigato (No Mr. Roboto necessary, sorry Styx) to the gang at Gear Diary. 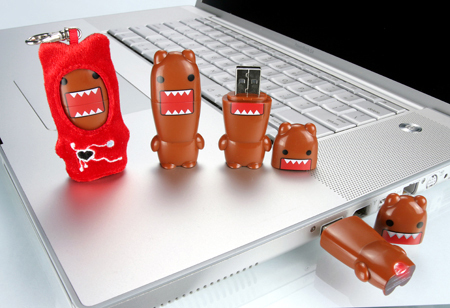 Gear Diary is having a month of give-aways and I was the lucky winner of this CUTE/functional Domo-Kun flash drive and a rubbery sea urchin-esque cable wrangler. I’ll be checking my mailbox the rest of the week in anticipation of the little fellow’s arrival in Hooterville. You too can win a cool prize. They’re giving away one every day in February. It’s a leap year so that gives you an extra chance to win. Head on over there and good luck to you!